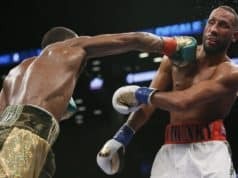 Light heavyweight boxer Badou Jack suffered one of the most horrific, bloodiest, gashes you will ever see in combat sports in his loss to Marcus Browne last night. Jack, who lost to Browne in the co-main event of the Manny Pacquiao vs. Adrien Broner fight last night, got off to a slow start. It was an accidental clash of heads in the seventh round that split Jack wide open. Covered in his own blood, incredibly Jack managed to go the distance, despite losing a ridiculous amount of blood. This is what referee Tony Weeks looked like after the fight. Yes, that’s Jack’s blood. It’s actually quite disturbing when you think about it. The fact that a human being can lose that much blood and still participate in an athletic event is mind-blowing. This is a big set back for Jack who losses a mandatory fight against WBC champion Oleksandr Gvozdyk. Browne will get the opportunity instead.